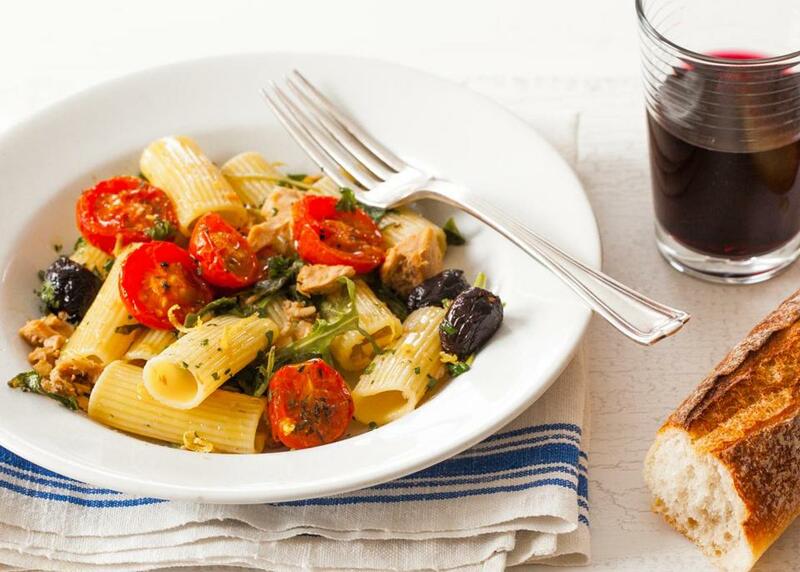 For the nights when you want to fill a few bowls with pasta and a quick sauce, so you don’t miss a minute of a Red Sox game, this mixture of roasted cherry tomatoes (you can make them several days in advance) with canned tuna, olives, and arugula, will fill the bill. You may have many of the ingredients already on a pantry shelf. 1. Set the oven at 425 degrees. Lightly oil a rimmed baking sheet. 2. On the baking sheet, spread the tomatoes in one layer, cut sides up. Sprinkle with thyme, salt, pepper and 1 tablespoon of the olive oil. Roast for 15 minutes, or until softened. 3. Bring a large pot of salted water to a boil. Add the rigatoni and cook for 12 minutes, or until it is tender but still has some bite. With a heatproof measuring cup, scoop out 1 cup of the pasta water. Drain the pasta into a colander; do not rinse. 4. Meanwhile, in a large flameproof casserole over medium heat, heat the remaining 1 tablespoon olive oil. Add the garlic and cook, stirring, for 1 minute. Add the tuna, olives, and 2 tablespoons reserved oil from the tuna. Cook, stirring, for 1 minute, or until heated through. 5. Add the drained pasta, lemon rind and juice, ⅓ cup of the pasta water, salt, and pepper. Cook for 1 minute, or until hot, adding more pasta water if the pasta looks dry. Taste for seasoning and add more salt and pepper, if you like. Turn off the heat, and stir in the arugula.